Ryse Promises "Mashing to Mastery"
Crytek says the concept of "mashing to mastery" in its upcoming Roman game Ryse means that anyone will be able to play, but there will still be a challenge for those who want to take it on. 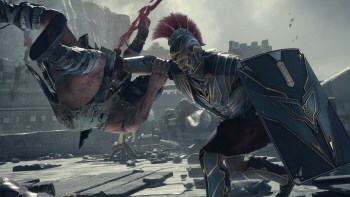 The Ryse presentation at E3 didn't exactly knock my socks off and my opinion didn't improve when it came to light that you don't even have to press the correct buttons in order to succeed: As long as you press one of the buttons on the controller in your hand, swords will swing, blood will flow and Roma Victor. It doesn't sound like much fun to me but according to Design Director P.J. Estevez, it's all about accessibility. "We have this concept we call 'mashing to mastery.' The idea is that anyone can play it and they can mash the buttons and fight, but if you get the right timing you're able to actually master it. Master the reaction you get out of the AI. You worked on the AI, you get them to this executable state and you execute them, and we're like, 'Why does it have to stop there? Why do I have to stop and watch this movie play out?'" Estevez told Game Reactor. "Because we've all played games that have executions and like 30 minutes into them you're like, 'Really, I smash this guys head, then I stab, then I kick him.' So we're like, 'Well, let's continue the flow, let's make it open up a window and let's give guys who want to spend time learning it more of a reward bonus'." The explanation appears to jibe with what we already know about Ryse, but I can't say that it does much to restore my faith in the property. I'm no fan of QTEs or "press X to murder," but if I can succeed at a videogame by getting my cat to bop the button while I go make a sandwich, it likely won't be long before I start to wonder why I'm bothering. Ryse is being developed by Crytek as an Xbox One launch title.